This Chaplain conversion is based off the artwork in the old Space Mairne Codex combined with the pose of the Flesh Tearers Gabriel Seth model. Put together, it makes for a very cool Chaplain conversion. I've been working on this guy for some time now as my free time has been limited over the past few months. That being said, he's finally done. I took what I learned from my first Black Templar Chaplain conversion and tried to build on that with this model. 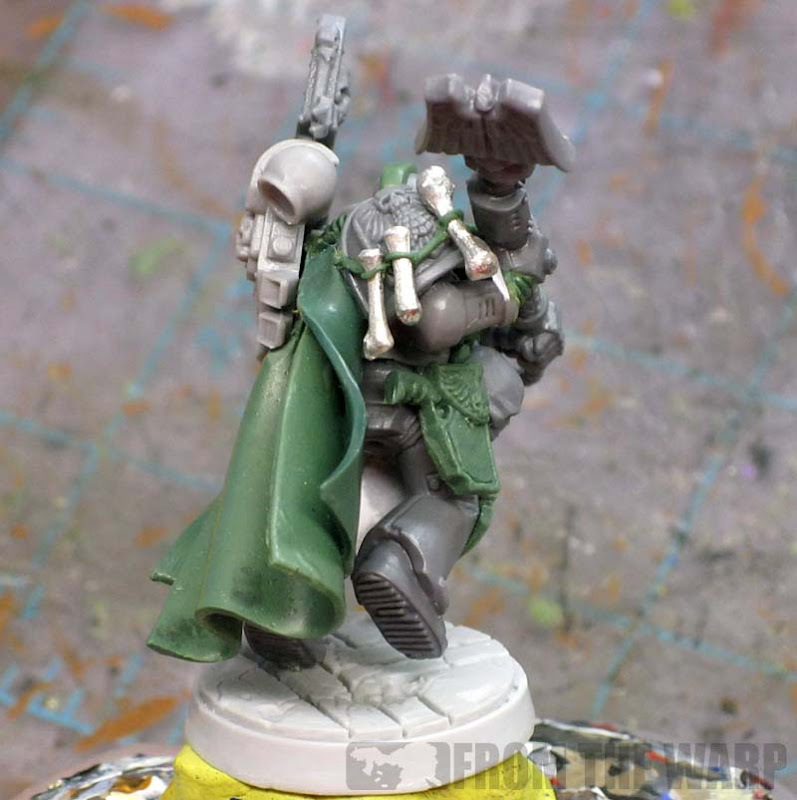 The biggest thing on this model is the greenstuff cloak. This is the first time I've tried sculpting a full cloak from greenstuff. I'd seen pictures and figured it could be done, but wasn't sure. Fortunately, my Client agreed to let me try my hand at it. I'll be doing a complete tutorial on the cloak itself in the coming weeks. I took some pictures as I was sculpting it and will put them together in their own post. It's not as hard as I thought it would be. The biggest thing is being patient enough to let the greenstuff cure before trying to fit it in place on the model. The half tabard was sculpted slightly differently. The tutorial for how that was done can be found here. I use a different process due to the size of the tabard and I like getting a number of folds in there which would be tough to do if I used the same method as the cloak itself. When it came to add the kneepads on this model, I cast them instead of trying to build each one individually. This made them a bit more consistent looking and allowed me some more flexibility when attaching them since the greenstuff bends. I built one kneepad, made a mold of it using BluStuff and then made a set of pads from that mold. Since it was simple one piece, press mold with no undercuts, they came out nice and clean. The skulls were taken from various places and cleaned up. The bones are from Secret Weapon Minis and I cut them down to individual bones, rounded the edges and glued them in place. This was far easier than trying to make greenstuff bones. The ribbed power cables were done using the Tentacle Maker from Green Stuff Industries. I used the SAW-020 (which is the smallest size) and it worked perfectly. The other cables are just thin lengths of greenstuff pressed in place. The purity seals are scratchbuilt too and I'll have a tutorial for those in the coming week. Those are easy to do and the ability to make your own to fit where they go on the model cannot be overlooked. The head is a conversion I outlined a while back. I really like the look of the skull helmet for Chaplains and I have two tutorials for it. One for power armoured Chaplains and one for Terminator armoured Chaplains. The arms are from the Blood Angles. I don't remember the exact bits, but I ended up converting those in order to get the position I wanted. I had to use a Chaos arm for his right arm to get a better position. I wanted him holding or swinging his crozius a little more sideways instead of overhead and upright. The base comes from Secret Weapon minis and is from the Ruined Temple line. I have to say it's one of my favorite lines because they are flat and still have such cool detail cut into them. I'm sure I'm missing something, so if you have a question about a specific part, fire away and I'll do my best to answer it. simply gorgeous. You're greenstuff work will always be a source of envy for me Ron. Can't wait to see him painted. As always Ron,amazing,the posturing is awesome and your sculpting gets better everytime. Really looking forward to the cloak article,I have a lot of trouble getting them to look 'natural' but you seem to nail it with ease.Have to say it again,WOW! 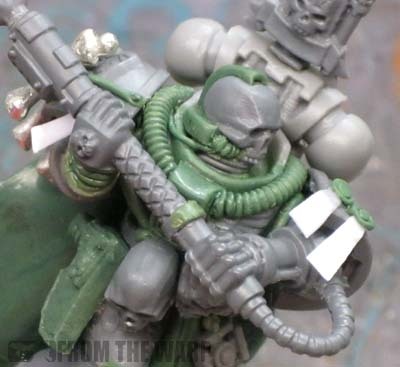 I assume the bone bits on the shoulder are from SWM as well? Did you consider using the SWM Sack o Skull's for the skulls on the chest? The ones you have used look a little oversized, whereas I think the SWM ones are of a smaller scale. 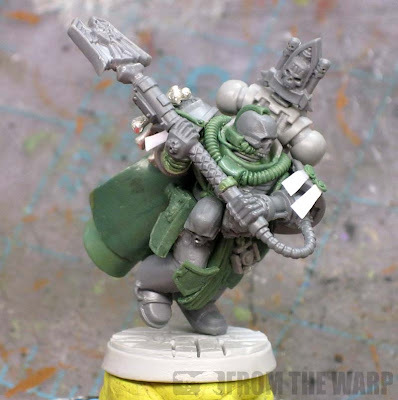 Great work again - love you chaplain, and librarian conversions. The model's even better than Gabriel Seth for the simple fact that it's converted from plastic! Very inspiring! Will you also paint him up? Sick. Absolutely Sick. In the good way of course! 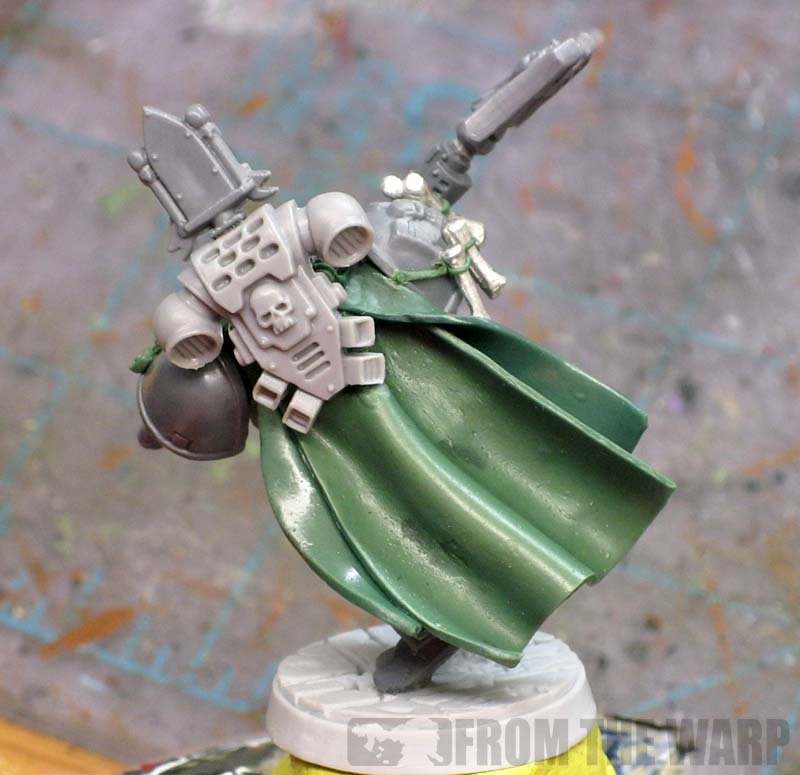 Looks incredibly man, especially love the two handed crozius, great idea! Impressive to say the least. I look forward to the coming tutorials! To say the sculpting is inspiring is a gross understatement. Loving the model and can't wait until he's finished and painted! Spectacular build, Ron! Love the sense of motion it has, keep up the great work! Amazing as always, will you be painting him aswell? The cloak tutorial is being worked on. I'll see if I can break down the process step by step. To be honest, it's not that hard. Rogue Pom: Yes, the bones on the shoulders are SWM. I would have used the skulls, but the metal ones are too problematic for me. Although the skulls are now coming out in resin. KrautScientist: Unfortunately, I will not be painting him up. The conversion work you see here is the extent of my work in the project. If my Client sends me pics of the painted model, I'll be sure to post them up. That's a very dynamic character, and all the sculpted details are thin and well made. Nice job. I'm not really fan of your purity seals... but nice work indeed! Snake88: I won't be painting this guy. I'm done with him at this point. If I get pics of him painted though, I'll post them. morbäck: Thanks. I much prefer to make my own so I have control over them and how they appear on the model. I understand it's not for everyone though. I know this has been said already but this is truly amazing! I would love to own one for my Astral Claws. Your models never cease to impress me, Ron! Well, done! The skull helmet is really nice. I'll be stealing that, BTW. Silar Lannanaris: Thanks. It took me a while and I'm fortunate he came out as well as he did. Like I mentioned, I wasn't sure about the cloak initially. Green Stuff Industries: Steal away. 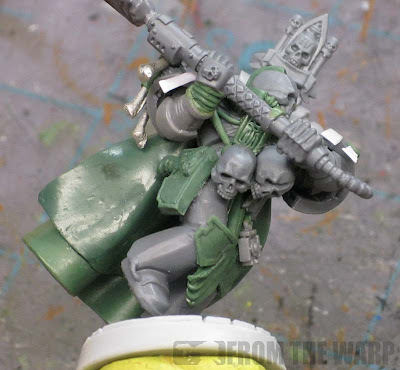 I've got tutorials on how I make the power armour and terminator armour Chaplains. You continue to amaze me with your greenstuff skills. Did you cast that pistol/holster or sculpt it? Thor: It's cast. I've sculpted them before and the effect is the same. The casting makes it so much quicker. Oh my, Ron, that's incredible. 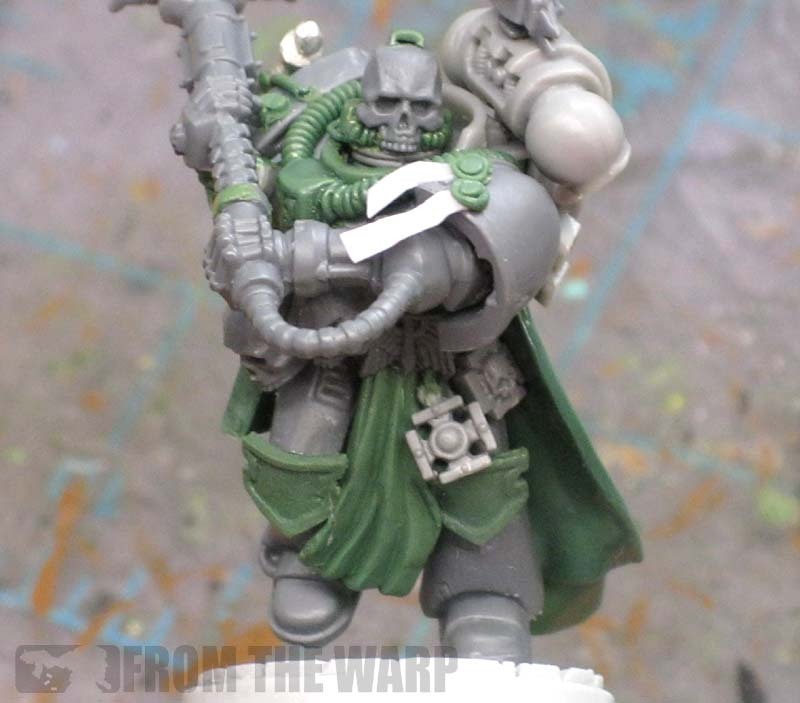 Honestly it looks a lot better than most of GW's chaplain models. I like how he looks bulky but yet dynamic. 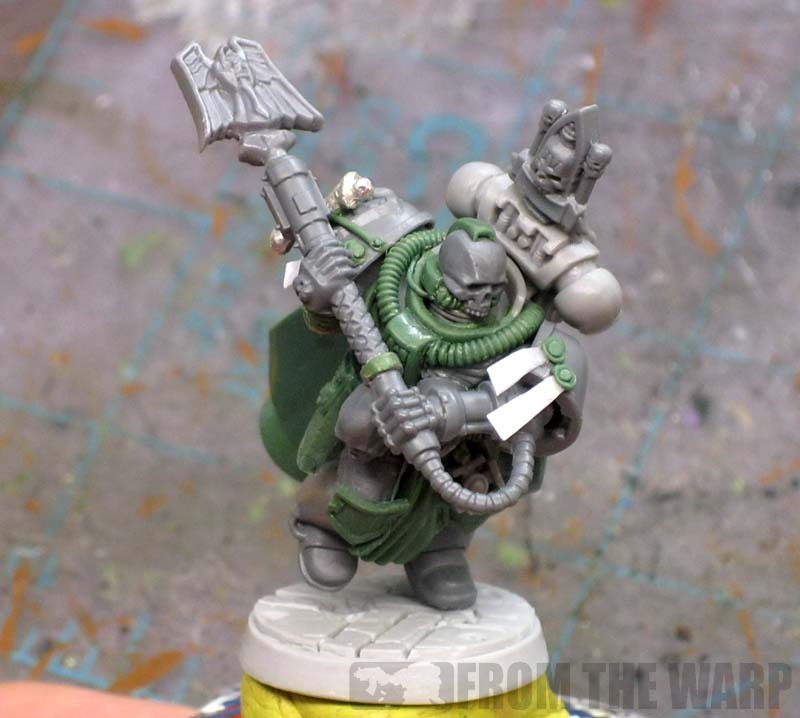 You chaplain conversions are great and a source of inspiration. Olberon: Wait until you see the Mystic model I completed. I'll be posting pics in the coming week or so. The tentacle maker was the only thing I had that would make building that model possible. If you can only afford one, get the SAW-020. It's the finest detail one and I use mine all the time now instead of trying to make each power cable by hand. Ron, man! First class work. GW really should consult with you. Every conversion I've ever seen you do is just simply a cut above everything else and whats more you write up tutorials for the rest of us. Fantastic work Ron. I have been following your work for quite a while now and your GS skills have improved ten fold in that time. It's inspirational to see a hobbiest who keeps pushing himself to achieve higher standards of work! Puck: Thanks, he could always be improved, but I think he's a huge step forward for me. dewi sant: Thanks! I appreciate the support. I keep trying new models to see what I can do. One day, I hope to be able to build a model from scratch without using a lot of bits. Something completely scratchbuilt. We'll see. when you are making your cape/cloack do you firstly make it off a flat surface? an un even surface or do you just mould it on the model? Chris: It's done on a flat surface.